Authentic Patina Copper Menu Covers feature a uniquely beautiful pattern and come in seven elegant colors. The binding and back panel are made of quality bonded leather and are available in three richly hued colors. A black interior is matched with black album style corners to hold your menu inserts. The Patina Copper Menu Cover is available with up to six views in five popular sizes so you can create a coordinating menu cover ensemble including dinner, wine, and dessert. 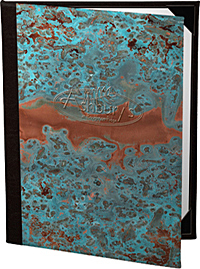 Patina Copper Menu Covers can also be customized with your logo.